Have you ever dreamed of drawing realistic dog portraits? Learn everything you need to know in How to Draw and Paint: Dogs & Puppies — filled with expert instruction, inspirational artwork, and insider tips for drawing canine companions of every stripe (and spot!). 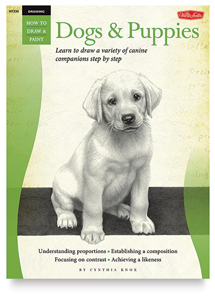 In these pages, artists discover an easy-to-learn process for rendering a variety of breeds (pug, golden retriever, great dane, and many more), a range of fur textures (short, long, curly, straight), plus the host of other defining characteristics that make dogs and puppies the picturesque subjects they are. The book also includes an introduction to the basic drawing tools and materials — great for beginners as well intermediate artists who'd like to brush up their drawing skills. From choosing the right drawing paper to mastering basic pencil strokes and perspective, How to Draw and Paint: Dogs & Puppies covers it all.